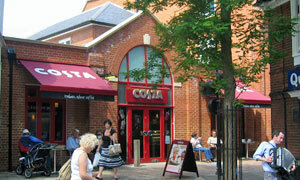 Maybe someone slipped the planning committee a mickey, for the town that has no Tesco has caught a Costa. Oops, there goes the neighbourhood. I'd guess that this particular "part of the Whitbread family" -- ah! -- narrowly missed being the 500th UK store, which, fact fans, opened near Oxford in December 2006. But in Woodbridge, they're here already: you're next! Sure have come a long way since I used to frequent their place at Glasgow Central station around 15 years ago. They've landed on their corporate feet and pulled out a plum location in one of the newly built units next to Woolies (see map), dead handy for the car park opposite the library. Innards are surprisingly spacious with sofas 'n' tables 'n' those really high chairs. Or you can take the weather with you, do as we did and sit in the sun outside. Great contrast with the precipitation peppered Pickwicks. Food and drink? Like those golden arches, you know what you're in for. Grab a prepacked panini, maybe some pricey crisps, and go take your little number back to your little table. They *will* find you. My meatball thing was unexceptional. G's All Day Club thing was "very good". Thumbs up for stocking good OJ and Orangina. Most pleasant, plonked there watching the Woodbridge world whirl by. Could have been outside some Parisian street cafe once the busker whipped out his accordion. Except that'd you'd lose your petite espresso cup in a Costa washing-up bowl. Fessing up, I'm most partial to a medio white Americano, ideally with an extra shot and a chocolate twist. One question: why make the saucer so that the cup sits well off centre? T'ain't right. If it was a car -- Enterprise Ford Focus. If they were passing by -- Phillip Schofield.